.defrag is a minimalist/surrealist game, drawing some influence from Yume Nikki and its ilk (.flow) while having a more concrete storyline. (Once again, a disclaimer, I still haven't gotten around to playing Yume Nikki so my perspective could be lopsided. Either way, it's got a stark, black/white/noise feel and soundtrack to match. The project is near completion, with just a few polish items missing, and total playtime is somewhere at 3-4 hours. This review should be mostly spoiler-free, covering the 1.3 preview release. The player character of .defrag is a humanoid figure, nameless and mute. While some friendly computer monitors give you some hints at the story as you're birthed into the world of noise, there's very little background and the world of .defrag exists mostly outside of any reality, sort of a standalone universe. Your character's lack of identify cements this. I was a little worried in the first zone - The Aether. With a literally faceless protagonist, randomy "noisy" environment, and no clear goal in sight, I wandered around a little bit, then luckily found my way out. The rest of the game is roughly broken into zones, each with some memorable characters, multiple lines of dialog, and visually distinct designs. At this point, the game is open-ended. I personally wandered around, talked to everyone in sight (once), and started to piece together the premise of .defrag: the world is under assault by a "noise virus" with varied and unclear effects. Eventually, once exploration is over, there's a series of not overly noteable fetchquests, but the game ends up turning linear. New areas (the Radio Tower, Purge Hospital) open up, there are some plot twists, and eventually a very thrilling buildup and finish where the game takes on some horror elements. The pivotal "loss of control" moment happens around Purge Hospital, where .defrag switches from open world to closed world, the pacing kicks up a notch, and the game turns genuinely unsettling. It's a very tight and well-executed second half. Notice that big flat portion after the climax? After the player visits every area, after the big mystery of .defrag is solved, after every character shows their true colors... then a whole new set of characters show up? There's two new sets of quests? And none of these quests actually expand on the world of .defrag or its mystery. While the new characters are all as fun as those in the first half of the game, they're simply irrelevant. The thrill is gone (there's no plot past this point, let alone plot twists) and the exploration is gone (no new maps, either). What's left? Character interaction, which is enjoyable enough, it's just not enough to make this part interesting. The second half of the game is empty content. Some of this is compounded by the mechanics .defrag uses to move the player from one plot point to the next. Most of the gameplay is "character A requests you to talk to character B," followed inevitably by "character B requests you to talk to character A." 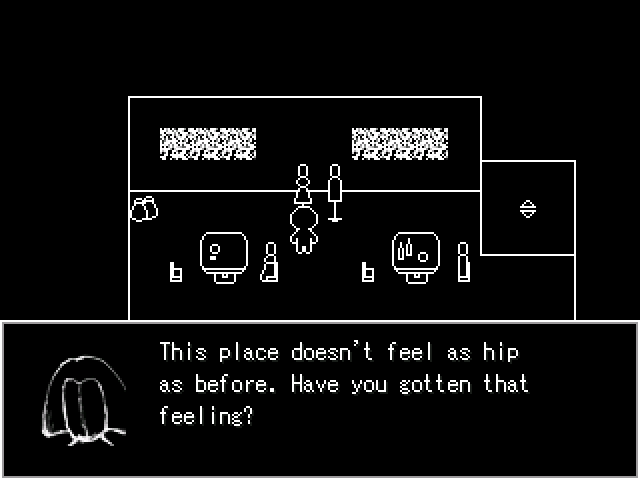 The other half of the gameplay is "character A talks vaguely about character B," after which the player is supposed to psychically determine that new dialog options have opened with Character B. Just because Bill mentions Blob, I'm supposed to know to talk to Blob again? This is the cause of the "wandering" segments on most of my graph -- new options had opened *somewhere* but I didn't know the where. This is compounded by the open-worldness of .defrag -- it's possible to explore places before the fetchquest series requires it. For instance, I was told to find The Hub... immediately after previously talking to every Hub denizen. Luckily, there are mitigating factors. Towards the endgame, characters offer to warp you to your destination. More importantly, there's a Speed Hax item that ups the walk speed, so retraversing areas isn't all that painful. I *definitely* would've quit without this item. It's a godsend from the developer and plenty of other games could take the hint. There's also a fast transport system to warp from one zone to another but for whatever reason, this system only unlocks in the second half, when there's no longer a reason to revisit zones. It's a pointless reward at that stage in the game. All that said, as soon as the player reaches the Radio Tower, there's about an hour where everything is purposeful, well-paced, and well-executed. It's ironically the most restrictive part of .defrag, but this game is so much better when you know your purpose rather than backtracking through zones looking for one. The first thing that jumps out about .defrag is that it's monochrome for the most part, and it has sort of a glitchy aesthetic, etc, which is all fine and I enjoyed the game's visuals mostly. But seriously, the most striking thing about this game is its amazing sound design. The BGM is 80% noise, 20% conventional soundtrack. The noise parts vary from inoffensive to oppressive and powerful. Radio Tower especially is about three times more intimidating than it has any right to be thanks to its sound. While it's not much to listen to on its own, playing .defrag without the sound on would be a huge mistake. The conventional pieces only show up around the climax, and while once again, they sound average removed from the context of the game, they work fantastically well where they're positioned. The final areas start to layer ambient melodic components on top of the noise, and then finally there's true affecting, orchestral pieces for the climax. It's a powerful constrast. Combine this with the minor SFX throughout the game (footsteps, doors, hospital ambiance) and I can safely say .defrag's biggest asset is its sound. Back to the visuals -- they work. The mapping is fine and varied between zones. Some areas are prettier than others. I especially enjoyed the wireframe sculptures of The Garden and the futuristic feel of The Hub. 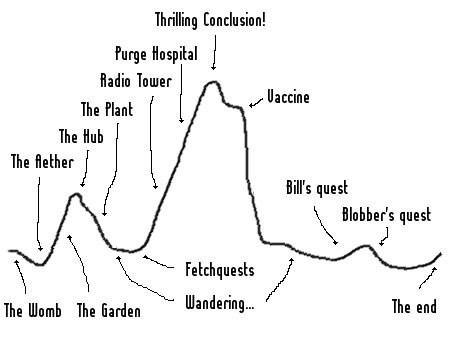 The glitchier areas of the game (The Aether, The Plant) weren't as fun, and some were uninteresting due to level design more than visuals, for instance, the hold-the-left-arrow-key Junkyard or infinitely-looping cellar areas outside The Hub. As mentioned before, the character visuals are spot on though. I only wish more characters were present in the first half of the game, because in the first half, apart from the wireframe NPCs, expect the only faces to be Blob and Jim. Luckily Blob is very... expressive. .defrag is fascinating and for the most part, fun. The half a game that comes after .defrag is superfluous not fun. While there are a few mixups caused by the exploration elements in the first half, it's ultimately a unique and engaging experience. What I'd want from a .defrag 2.0 is its postgame content tucked into its first half. Most of the problems in the first half are what-do-I-do where-do-I-go problems that probably can't be solved without killing the fun that is exploring the world on your own, but more content there would definitely cut down on the "Wandering..." moments. The second half can be cut entirely and I'd recommend anyone looking to play .defrag (you should), just quit after leaving Purge Hospital. It's a quirk of the game that it can be "ended" at any time after the climax, so consider the rest very (VERY) optional. In fact, there's one exact moment I can pin down as what feels like the "real" conclusion to .defrag. It's a scene in the hospital just after the climax where the player finally learns the fate of their predecessor, the person who placed all those signs around the world. If the low points of .defrag are backtracking through environments looking for someone whose dialog changed, then this is the high point: haunting use of sound, a well-told story, a discovery, and an emotional kicker. Play this for the good stuff. Wow, thank you for your detailed review! It's been a while since I've actually logged in here, so seeing this review was a pleasant surprise. Right now I'm working on the Garden, Plant and Junkyard areas. I'd like to make them a little more visually interesting and give people something to look at while they wonder about in the first half. Before v1.3, Bill's quest was basically a side quest that didn't influence the final outcome whatsoever. It was just a bonus (fast-traveling) that was fairly forgettable since by then, there wouldn't be anything left to do in the world. I enjoyed this review very much and the visual aids made the experience more relatable. Glad to hear there's more in the works. One point of clarification -- I don't feel like the second half is missing a climax so much as the world feels like a solved system at that point, where there's no need for a climax because there's no mystery. Once that question of "what is this place?" is gone the game feels pretty much over, even if there's still some action playing out. Will definitely play when next version's up. Sounds neat, would be more than happy to hear what's up. PSA: As of 2018, this review was written for an EARLY ACCESS version of the game. Due to the changing nature of its development, certain points made in this article may no longer apply in the future. I still think it's important to preserve this review for archiving purposes and for the sake of highlighting the game's development journey.